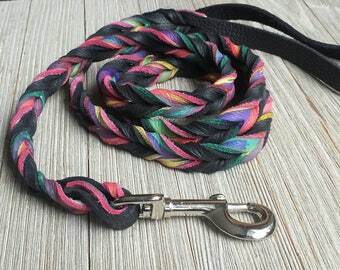 This leash combines white leather and tie dye with a splash of orange, teal, lime, green and blue. It comes in a width of 5/8" and a nickle or brass snap. Convo me if you want a different width, snap and colors. Each leash is unique and the picture might be a bit different than the leash you get. However, the colors will be the same. THE. MOST. BEAUTIFUL. LEAD. I. HAVE. EVER. OWNED. (and I have owned MANY leather leads)! Such beautiful colors and it is SO soft! This is the only place I will come to from now on when I need any leads. THANK YOU! Anne is so talented and so patient when making a custom order!!!!! I love everything she makes!!! I accept major credit cards. For checks and money order, please contact me to make arrangements, (please allow 7-10 days to clear). Q: How do I measure my pet's neck? A: I recommend using a soft tape measure and if you don't have one of those, use a piece of string and a ruler. Measure around the widest part of your pet's neck, or where their collar sits. Don't measure too loosely, as I add 3"-5"(depending on the collar size) to the measurement you give me to ensure the collar has room for adjustment. Q: How do I wash my nylon collar? A: I hand wash all my dog's collars in warm water with hand soap. And I always recommend that you hang the collars to dry. We ship within 3-5 business days after receiving your cleared payment. Items are shipped via the USPS first class mail. Expected ship time with (USA) first class is usually 3-5 business days.